After recently seeing early performances by Robert Mitchum in two top-notch World War II films, Thirty Seconds Over Tokyo (1944) and Story of G.I. Joe (1945), I was a little disappointed by his starring role in West of the Pecos. Mitchum is one of my favorite actors, and he’s always interesting to watch, but this movie is hard to take very seriously. After small roles in a variety of films (including some Hopalong Cassidy westerns), and a larger role in William Castle’s B noir When Strangers Marry, Mitchum was signed to a contract by RKO, who needed a B western star in the Tim Holt mold. I haven’t seen the first western Mitchum made for RKO, Nevada (1944), which is based on a Zane Grey novel, but if it’s anything like West of the Pecos, I don’t think I’m missing too much. 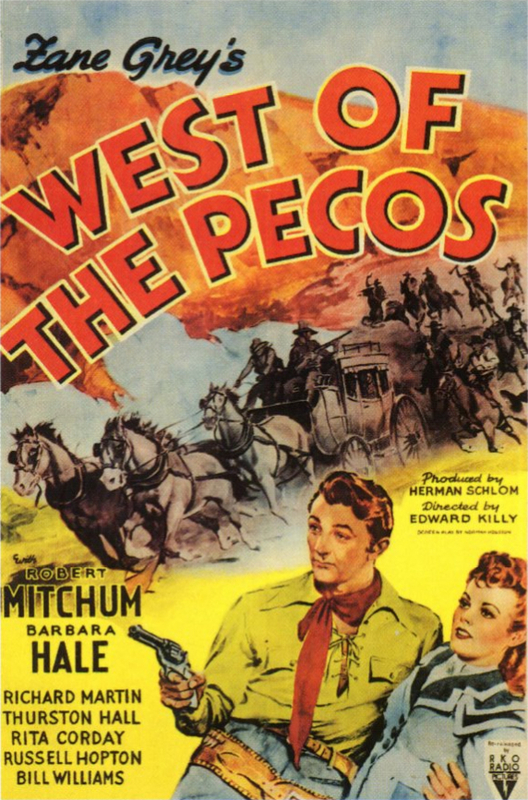 Like Nevada, West of the Pecos is also based on a Grey novel, and is typical “romance of the West” malarkey. In terms of plot and character development, it has more in common with 19th-century stage drama than anything else. In West of the Pecos, Barbara Hale plays a young Chicagoan named Rill Lambeth, whose father, Col. Lambeth (Thurston Hall), is ordered out west for his health. The two of them travel by stagecoach to Texas with their French maid, Suzanne (Rita Corday). In the course of their travels, they cross paths with Pecos Smith (Mitchum), an outlaw who’s seeking revenge against the corrupt vigilantes who killed his best friend. There are plenty of western tropes in West of the Pecos, like shootouts and unconvincing portrayals of Mexican bandits (Richard Martin plays their leader), but at its heart it’s a light-hearted romance and cross-dressing farce. Soon after her arrival in Texas, Hale decides to dress as a boy to dissuade all the nasty cowboys she meets from sassing her. To say she makes an unconvincing fellow would be an understatement. Her long, flowing hair is simply piled up and pinned under a ten-gallon hat, and all she does to hide her pretty face is rub a little dirt on it. Their relationship is based on kidding around, but it’s so flirtatious that I was actually surprised at the end when Mitchum’s character acted shocked when he found out Hale was really a young woman. He plays all their scenes together as if he has every idea what’s going on. Take, for instance, the scene by the campfire in which Mitchum tries to convince Hale to get in his bedroll with him on account of the nighttime chill. He rolls over on his side, faces her, and throws the blanket aside. “C’mon, kid, get in,” he says. “But … I want to sleep alone,” she responds. It’s interesting to see Mitchum in this type of role. Not too long after appearing in this film, he would receive the only Oscar nomination of his career, for his role in the much better film The Story of G.I. Joe. After that, his days of starring in movies like this were pretty much over. Not every picture he made was great (some of them were even pretty bad), but by 1946 he was on his way to becoming an A-list actor, and eventually a Hollywood legend. Posted in 1945, August 1945 and tagged Barbara Hale, Edward Killy, Harry J. Wild, Herman Schlom, Norman Houston, Paul Sawtell, Richard Martin, Rita Corday, RKO Radio Pictures, Robert Mitchum, Roland Gross, Sid Rogell, Thurston Hall, West of the Pecos, Westerns, Zane Grey. Bookmark the permalink.